Noida: On the first visit of H.E. 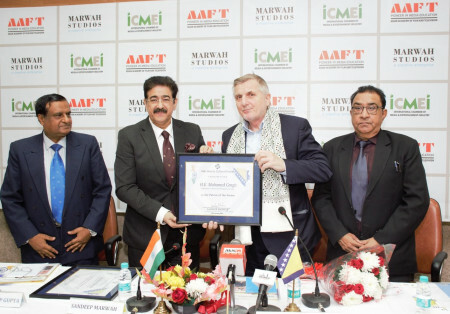 Muhamed Cengic the new Ambassador of Bosnia And Herzegovina to the International Head Quarters of International Chamber of Media And Entertainment Industry signed MoU to promote art and culture between two countries. “I know ICMEI has a wonderful relation with Embassy of Bosnia in India and we are working together for the common cause of building powerful relation between two countries. Indo Bosnia Film & Cultural Forum has completed one year of its existence, we have to move forward,” said Ambassador Cengic. We are pleased to honor Ambassador with the Patronship of the form as we will be able to work faster under his leadership,” said Dr. Sandeep Marwah President of ICMEI while handing over the certificate of Patronship to Ambassador. Ambassador Muhamed Cengic presented his credentials to H.E. Mr. Ram Nath Kovind, President of the Republic of India, on 7 th December 2018. Ambassador Muhamed Cengic is a career diplomat with more than two decades of experience in the Bosnia and Herzegovina Foreign Service. Prior to his current assignment, he served as Ambassador of Bosnia and Herzegovina to the Republic of Indonesia, Republic of Singapore and DR Timor Leste. Ambassador Muhamed Cengic pursued Faculty of Political Science at Sarajevo University, Bosnia and Herzegovina and diplomatic training course from Institute of Diplomacy and Foreign Relations, Kula Lumpur, Malaysia. His Interest includes photography, bee keeping. Apart from Bosnian language, Ambassador Muhamed Cengic speaks English and Russian.